The evidence for the presence of thermite at the World Trade Center (WTC) on 9/11 is extensive and compelling. This evidence has accumulated to the point at which we can say that WTC thermite is no longer a hypothesis, it is a tested and proven theory. Therefore it is not easy to debunk it. But the way to do so is very straightforward and is in no way mysterious. 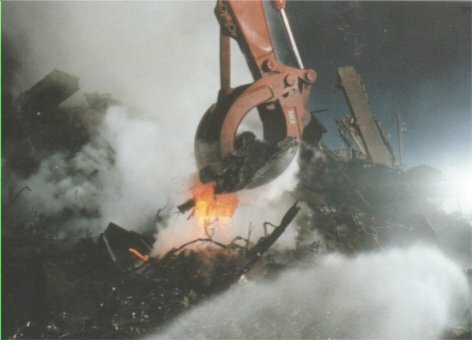 Molten metal: There are numerous photographs and eyewitness testimonies to the presence of molten metal at the WTC, both in the buildings and in the rubble. No legitimate explanation has been provided for this evidence other than the exothermic reaction of thermite, which produces the temperatures required and molten iron as a product. The fires at Ground Zero could not be put out for several months. Despite the application of millions of gallons of water to the pile, several rainfall events at the site, and the use of a chemical fire suppressant, the fires would not subside. Thermal images produced by satellite showed that the temperatures in the pile were far above that expected in the debris from a typical structure fire. Only thermite, which contains its own oxidant and therefore cannot be extinguished by smothering it, can explain this evidence. There was a distinct “white smoke” present—clearly different from smoke produce by a normal structural fire—as indicated by eyewitnesses and photographic evidence. The second major product of the thermite reactions is aluminum oxide, which is emitted as a white solid shortly after reaction. A peer-reviewed scientific publication has identified the presence of nanothermite in the WTC dust. One of the critical aspects of that paper has been confirmed by an independent scientist. There is also a great deal of indirect evidence for the thermite theory. This includes the attempts by NIST to downplay the evidence for thermite. It also includes things like a weak effort by Rupert Murdoch’s National Geographic Channel to discredit the ability of thermite to cut structural steel, which was itself roundly discredited by one independent investigator. It is now unquestionable that thermite can cut structural steel as needed for a demolition. Deceptive efforts to introduce the government contractors who produced the official accounts as independent scientists. Millette is well known for having helped produce the official reports on the analysis of WTC dust. He was responsible for creating the form that was used to pre-screen all materials found in the dust prior to any analysis by official investigators. Those official reports did not mention any of the evidence listed above, in particular failing to report the abundant iron microspheres scattered throughout the WTC dust. Additinally, Millette’s official report team did not find any red-gray chips, let alone nanothermite. Claiming to have found the chips, Millette perfomed an XEDS analysis for elemental composition but failed to do any of the other tests including BSE, DSC, the flame test, the MEK test, or measurement of the chip resistivity. Having inexplicably “ashed” the chips at 400 °C in a muffle furnace, thereby proving that they were not the nanothermite chips (which ignite at 430 °C), Millette ignored the remainder of the study he had set out to replicate. Because he did not do the DSC test, he could not do XEDS of the spheres formed from the chips. Since he had still not found spheres in the dust, he could not test those and this allowed him to ignore the testing of spheres produced by the thermite reaction. I’m looking forward to the peer-reviewed scientific article that finally does replicate the nanothermite paper or any of the other peer-reviewed scientific papers that give evidence for thermite at the WTC. Hopefully, we can approach those efforts without concerns about the sources and without recalling all the deception and manipulation that preceded them. The title is catchy; the evidence is solid. Thanks, Kevin -- well done summary. You are correct that while we have done repeated experiments and tests (following scientific methodology) and then published in peer-reviewed journals, the "debunkers" have not followed suit. Your essay basically challenges debunkers (or alternative theorists) to do actual experiments of their own - and to publish peer-reviewed papers regarding their claims. Historically, when I spoke of thermite evidence (usage on 9/11) at the Utah Academy of Arts and Sciences in April 2006, I was immediately thereafter contacted by a fellow (C. Martin Hinckley) who identified himself as a government contractor and strongly warned me to not speak of thermite or its use. More about this fellow and his threatenings are documented in the video "Hypothesis", available on youtube. ProfJones on Sun, 12/08/2013 - 11:25pm. Is anyone here on good terms with Ryan or Harrit? Ryan mentions experiments regarding nanothermite and nanotubes and also unpublished FTIR data. This sounds like excellent material for a couple of new papers and we should provide some encouragement. Do they need funds raised for more experiments and publishing costs? Simon001 on Sun, 12/08/2013 - 11:26pm. That's a no-brainer. Problem with studying the WTC-dust is that independant scientists have run out of it. At least that's what Niels Harrit told the audience (of which I was a part) 2 years ago in Amsterdam. But I believe Denzel Washington has some dust that he has kept, apparently for over 12 years now (I believe I read that on this site). Other than that, NIST must have some fair amount of dust as well. And surely more people from NYC must've kept some of it as a reminder of what happened that day. Sandberg on Mon, 12/09/2013 - 3:31pm. The first thing that strikes me is that we may not need more research for the FTIR paper, but maybe someone here could ask Ryan to make sure? At first I thought the simple thing would be to ask Ryan to write up a paper for the Journal of 9/11 Studies but given due consideration I think it would be a better idea to raise some funds for a mainstream journal. 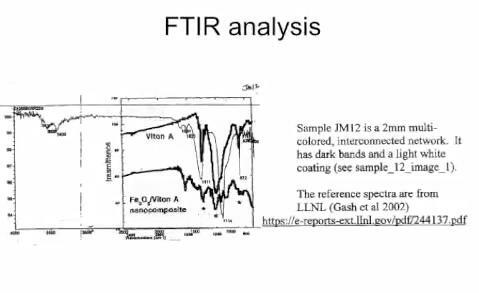 My reasoning is that we should use all the work done by Chris Mohr and his friends to advertize the paper by Millette that never got published, which would be especially fitting because they emphasized above all Millette´s FTIR data. The JREF forum members that directed Mr. Mohr to Dr. Millette did us a huge favor and we should seize the opportunity. If more dust is needed then lets put 911blogger and ae911 to use and advertize for dust. Ask NIST for dust. Whatever it takes. Simon001 on Mon, 12/09/2013 - 6:01pm. It can be amusing if you have tons and tons of time to waste (as they seem to). But there is little honest attempt at establishing facts. Their primary purpose is to discredit legitimate 9/11 inquiry. Until recently, many of them thought that nanothermite was an imaginary substance invented by Drs. Harrit and Jones. Seriously. jnelson on Tue, 12/10/2013 - 2:48pm. That forum has been self-destructing since their own hero Dr. Greening gave them the finger, but it seems poor Chris Mohr did not understand the kind of company he has involved himself with. I don´t know if he has realized how sad and ridiculous they all look with their unreviewed and unpublished rubbish of a paper by Millette, but judging by the sorry state of the forum these days it seems all but the dumbest have left the building so to speak. But they did us a huge favor by getting a NIST contractor involved with and stuck with an unpublished thermite paper. The display of a gov. funded contractor backing away from "a debunking" of Harrit´s nanothermite paper is one of the best adverts possible, much better than most made available by cash. They have given us a great opportunity to put out more thermite papers and easily spread the word with fantastic back-up. I know the upcoming paper by Mark Basile will benefit from this but the truther community should use this opportunity to put out more papers. Simon001 on Tue, 12/10/2013 - 8:54pm. JREF appears to be a classic example of pseudoskepticism. As such, they tend to very selective of what they express skepticism about, cherrypicking what they address - and they tend to favor authority opinion and the establishment position on an issue (especially when controversial), and disregard data, facts and findings that run counter to those opinions and positions. This is clearly their take on 9/11, and as such their approach is a perfect example of abusing the scientific method . The 9/11 Commission followed an exact parallel - disregarding, misrepresenting, distorting, omitting or flagrantly lying as regards findings, data and facts that ran counter to their predetermined, politically mandated, conclusion. bloggulator on Wed, 12/11/2013 - 5:58pm. I think most of them are just people with way too much time on their hands trying to look smart by defending the establishment. But there are most likely also a couple of shills amongst them to toe the party line. And then there are the odd exceptions that are bothered by the 9/11 event and need to find convenient answers that soothe their concerns, and put themselves back to sleep. I think Chris Mohr might be one of those, but I suspect that most of these types left the JREF forum a long time ago due to the childish hostile name-calling and general level and frequency of BS. In the last 12 months or so it seems some of them realized that Millette left them holding a turn in their hands, and Tony Szamboti and others demolished their beloved myths regarding the collapse initiations of the Twin Towers and WTC7. The JREF 9/11 forum is in shambles and so is the whole "debunker" scene. It is about time we forget about these clowns and move forward with more published papers and lawsuits! Simon001 on Wed, 12/11/2013 - 9:52pm. Why can't a court order be obtained to secure samples from the Fresh Kills Landfill? About two million tons of material obtained from Ground Zero were taken to the landfill for sorting. there would be no question as to whether the dust was really from Ground Zero. I always wondered why no one ever tried to use legal means to secure dust samples from Fresh Kills. SCAFFOLDRIDER on Wed, 12/11/2013 - 8:10pm. That is an excellent question but I don´t have the answer. Maybe this IS a venue for more dust and perhaps NIST is another...? Kevin Ryan is most likely the one to ask for comments, and I suggested in a previous comment here that "we" talk to him about this kind of stuff to prepare for getting out more thermite papers. Simon001 on Wed, 12/11/2013 - 9:48pm. Re. WTC dust - for any sample and its subsequent analysis to have value and credibility - the dust should come from a place with the minimum risk of contamination. Its collection should be carefully documented and the dust should be placed inside of a clean, chemically inert container. The entire collection process, right up until being sent or delivered to the lab should also be video recorded in good lighting conditions - for documentation backup as well as providing additional verification of the chain of custody. Any sample which is not properly collected or documented is of far less value, as debunkers will (rightly) seize on that deficiency and jump on it from a great height. The dust and debris which are in the Fresh Kills landfill have been subject to rainwater from the surface for 12 years, which would have leached down into the landfill alongside other material deposited there before and afterwards, and likely have resulted in cross-contamination rendering the samples virtually useless. WTC dust for collection and analysis should preferably be from a dry and unused space. There must be many places which would qualify as such in Lower Manhattan - such as roof spaces, attics and other unused or undisturbed spaces where the microscopic dust may have collected on the day and was never cleaned up. bloggulator on Wed, 12/11/2013 - 11:55pm. Maybe the landfill is no good, but I do wonder. You are probably right that there are other more likely options. What about asking NIST for dust or even Dr. Millette? What about asking AE9/11Truth to put up a couple of ads for dust? Are we sure that Harrit et al are out of dust? I seem to remember something about Harrit talking about receiving more dust in one of his lectures..
Simon001 on Thu, 12/12/2013 - 12:57am. Both Ryan and Harrit are giants in the 911 Truth movement. Their work has been so important to the Patriots. To answer your question, yes, they need money. I lead the effort to translate Harrit and Jones' et. al. "Thermitic" paper into Chinese. The Chinese translation took over two years of careful work using members/scientists from the Chinese Science Academy. Academics in Chinese and English were also used to provide the finished polishing touches to the paper. I have been in southern China but will return to Beijing soon and restart my effort to get this paper published in a scientific journal. I argue that although scientific peer reviewed articles usually can be printed one time, the new translation constitutes a new work and should be exempt from this rule. If not, I still need to be in Beijing to get this paper out main stream. I will tell you this. Every Chinese scientist and academic have responded the same way to my questions. 1. Did you find any scientific flaw within the paper? 2. Any chance the nanothermite chips being paint? A. (Universal chuckle/derisive laugh) No. 3. Did you find any typos, grammar, translation or even layout mistakes? beijingyank on Fri, 12/27/2013 - 2:44am. A much needed effort, many thanks! Thank you indeed for this great effort. I would almost guarantee that the people of China have had very little chance to read about the reality of 9/11, as regards proper, successfully peer-reviewed, science. bloggulator on Fri, 12/27/2013 - 1:44pm. The great thing about my three years teaching in China was you could talk about 9/11 and people would say: "Oh, that makes way more sense than what we were taught in school." Some would add: "Of course all governments do bad things to their own people -- always have, always will." It's the same in Uzbekistan where I work now. kwaisabai on Tue, 04/08/2014 - 2:25am. Excellent summary, Kevin. The "thermitic" explanation is the only hypothesis that has evolved as a result of hard data, analysis, and experiment - the heart of the scientific method. All other "explanations" of the collapse of the WTC towers and #7 are either speculative, or politically motivated. "Why on earth would the perps use thermite to demolish a building(s) rather than the types of explosives in common usage in the demolition business"? (2) These chemical characteristics of normal military or blasting charges are also the basis of explosives detecting security technology and equipment, and explosives sniffing dogs are trained to detect such using their keen sense of smell. Thermitic composites cannot be detected by equipment designed to detect more commonly used nitrate/perchlorate/organic compound based explosives. Likewise, explosives sniffing dogs would have turned up a blank. The WTC was bombed in 1993 using an ANFO (ammonium nitrate + fuel oil) type of bomb, and security in in the complex in the the years after this attack had been drastically tightened. By employing thermitic composites, the bomb detection security systems at the WTC would have been readily bypassed, ie rendered useless. Again, very convenient! (3) nanothermite provides the perfect cover as regards explosives residue, in that the reaction products of (nano)thermite are metallic iron and aluminum oxide, two very common substances that would not raise suspicion or indication of a controlled demolition.... and since the Twin Towers framework was made of steel (iron), and the airplanes' fuselages were built of aluminum, the use of thermite provided the tailor -made cover. In other words (nano)thermite was 100% ideal in preventing any forensic examination from readily identifying explosives…that is, using normal tests for normal explosives. (4) This is a little more speculative, but perhaps worthy of consideration: Perhaps a thermite demolition would have a different, or unfamiliar set of qualities, (sound, light etc), to the usual telltale signs of the traditional building demolition sequence that everyone has seen countless times on television over the decades.... to what we have been accustomed...therefore causing less suspicion the part of the public? bloggulator on Mon, 12/09/2013 - 2:49am. I think it's likely a combination of explosives were used. The authors of the various papers are careful to not rule out the use of conventional explosives in conjunction with thermitic materials. jkeogh on Mon, 12/09/2013 - 5:21am. Kevin gives an excellent summary of the thermitic evidence at the WTC, which either contributed to the demolitions or was solely responsible for them. However, there's also evidence for secondary explosions prior to the demolitions and for basement bombs. I haven't read anything by AE911Truth or Kevin Ryan regarding bombs in the WTC as something apart from thermitic materials and what role (if any) they might have played in bringing down the buildings. Perhaps they were only for terrorism as someone recently suggested? But they do seem to be part of the explosive evidence. Whoever planted or parked bombs in the WTC was part of the 9/11 plot same as those who planted nanothermite. RL McGee on Mon, 12/09/2013 - 3:57pm. Why use conventional high explosives for the other detonations? It is not impossible that *all* of the detonations were caused by nanothermite - why would the perps use conventional high explosives (bearing in mind the risk of detection, see my post above) when it appears that nanothermite can do the same job. Since this material has been developed by the US military over the last 3 decades or so, it is not inconceivable that aspects of its development are classified, thus there is no way of verifying how far advanced its development was in the year or two leading up to 9/11, when the perps would have needed to acquire this material in large enough quantities to do the job in hand. bloggulator on Mon, 12/09/2013 - 10:24pm. As for the secondary / basement explosions, do you think they played a functional role in bringing down the buildings, or do you think they were simply for terror as kawika suggested. Just curious what you think. RL McGee on Tue, 12/10/2013 - 9:56am. Anyone have links to numbers? I'll make a resource page on 911encyclopedia if so. High explosives yield blast velocities in the range of 3000m/s to 9000m/s and achieve pressures of around 700tons/in^2, which is why metal behaves like a liquid when the shockwave interacts with it. I presume that nanoenergetics are responsible for the main sequence, the lack of floor pans and the floor by floor explosions seem to require large areas to explode. And the color of the gas generated is consistent with Aluminum Oxide. As many have pointed out, thermite would be a excellent choice for pre-weakening as well. But stuff like this: http://s3.amazonaws.com/nasathermalimages/public/video/Relics_in_the_Rubble_Bent_Hbeam.wmv makes me suspect conventional high explosives were used for some structural elements. jkeogh on Tue, 12/10/2013 - 8:04pm. I don´t think anyone ruled out conventional explosives along with thermite type materials but why would anyone need ce´s? Nanothermite based cutter charges would not need the ultra high power delivered by conventional explosives because they would rely on the molten metal to do the cutting, not the shock-wave. We may not have ready sources to indicate that there were nanothermites capable of matching the best high explosives at the time even though we have sources indicating that they have the potential to match or exceed them. But even if the culprits had been stuck with lower power nanothermites and still wanted to use some as explosives along with cutter charges to direct and control the collapses, then they simply would have been forced to use a lot more of it per floor compared to C4. This would actually explain why there is such a sh$$load of chips and spheres in the dust! Simon001 on Tue, 12/10/2013 - 11:54pm. In large part, the evidence concerns the effect of nanothermite on steel. But one of the striking things about the destruction of the WTC towers is how thoroughly the concrete was pulverized and reduced to dust (something else that--like the swift collapse of the steel structures--gravity does not account for). Could that also have been an effect of nanothermite, or might conventional explosives be a more likely explanation? And what about those reports that bomb-sniffing dogs had been removed from the towers some time in the weeks prior to 9/11? That would have made the situation more favorable for bringing in more conventional substances in addition to nanothermite. rm on Thu, 12/19/2013 - 1:38am. Did someone not include nanothermite infused tiles under the floors in a "hypothetical" scenario to explain the observed pulverization? The culprits must have tried to minimize as much as possible the use of conventional explosives, but perhaps they still used some. Unfortunately I don´t think we can ever say for sure because any traces in the dust may have decomposed by now and most of the steel evidence was destroyed. The removal off the dogs may suggest the use of conventional explosives but it is not strong evidence. Was all security removed or just the dogs? If the masterminds told the security apparatus to "stand down" at certain times, would they had to specifically mention the dogs? Would they bother to explain that "you can leave the dogs though because they can´t detect our stuff"? When you get rid of the dogs you also get rid of the persons that handle them which are presumably also trained just as well as the dogs..
Simon001 on Thu, 12/19/2013 - 3:41am. with his hypothetical blastscenario, with the thermitic ceiling tiles. Don't really know what to think about that scenario. Another thing to ponder over are the vast amounts of paper sheets that were flying around when the Towers had just disintegrated. I asked David Griscom about that one or two years ago, about what could've caused that (that is, paper sheets remaining intact while concrete got pulverized and steel beams melted, in other words, why didn't all of that paper get burned while there obviously was a tremendous amount of heat present?). He replied that it had to do with pressure that created all or most of the destruction, not heat. I believe this issue of the paper sheets hasn't been covered all that much. One more mystery to add to the large volume already present. Sandberg on Fri, 12/20/2013 - 8:48am. One way to find out if conventional explosives were needed to account for some of the observed phenomena would be to get more papers on the matrix material specifically, and also the chips found with multiple layers and the strange white coating that Ryan mentions in the FTIR slide. Harrit et al. could perhaps figure out what kind of effects these additional materials add to the std nanothermite mix. Their referenced papers suggest that these kind of additions add explosive power, and perhaps they could figure out roughly the composition of these layers and hence the power potential. I hope to see at least one more nanothermite paper published before 9/11 2014. Either Basile´s paper or Ryan´s FTIR paper, or both. Simon001 on Fri, 12/20/2013 - 2:51pm. RE: downvote of "More papers needed"
Mr. Downvoting Man, why the hate? I fail to see what is so offensive about that post. Simon001 on Fri, 12/27/2013 - 1:06am. Shockwaves cause more damage to structures that break when deformed. Somewhere I remember a interview where a first responder was talking about finding the tough plastic star wheel bases that many swivel chairs have. Anyone know where that clip is? The majority of steel melting most likely happened during the pre-weakening stage and in the pile of exothermic debris after the event. As Mr. Griscom said, explosives do work via gas pressure, the heat that thermite based explosives generate is just a way to get the gas generating material it's coupled to to do it's thing. It's a somewhat common claim that "the concrete was pulverized", and it's true, but of course it's not absolute. A spectrum of concrete sizes were generated. The speed which they fall out of the dust cloud is a function of their mass and volume. jkeogh on Fri, 12/20/2013 - 9:39pm. Sandberg on Sat, 12/21/2013 - 9:24am. Distraction. Like a magician, the bombs in the basement that coincide with the impacts were overlooked by the action well above. The reason: Blogger nk-44 and chopoz did speculate it was for a hidden, a concealed controlled demolition. With the plane impacts main members of the statical structures in the basement could have been taken out without destroying them completely. Maybe straight horitontally cuts, to be effective in totally leveling the buildings at the very collapse onset. Maybe the only loud task in the destruction of the Towers. And if they were to take place later with the onset of the fall it could have been to obvious. Other goals, possible implied in the bombings. To destroy safety. security surveillance, to hinder anyone reaching the fire impact zones by destroying the local elevators, to destroy water risers for the Sprinkler (like photographed by John Labriola in the lower floors of the WTC North Tower core) to reach the cover that "fire did it" was more plausible. There are many valid reasons other than pure terror for the bombings. And I wonder why it took years that Kevin reported on it and freed the infos from their outsider stance within even the controlled demolition hypothesis. Sitting-Bull on Sun, 12/22/2013 - 5:34pm. The jet engine is composed of steel and titanium - melting points of 2800-3040F. The wings are more flammable because of light, strong composition with Aluminum, carbon fiber, other metals and plastic in some models. Jet fuel burns at 1400, so if those wising to use a jet as a bomb, as the scenario was with the WTC, and cause it to melt the steel in the WTC, the jet engine would have to burn fuel at the temperature of the engine - which means the jet engine might even start melting on the runway or soon after. The jet would also have to include a furnace on board. End of NIST fantasy. marzi on Fri, 12/27/2013 - 10:57pm. jkeogh on Mon, 12/09/2013 - 1:34am. There is no difference on 911 than JFK................... We know the truth, as do most Americans. Twelve years, and fifty years. The same results. The problem is MSM. Until that changes ...... Nothing does. WISDOM on Wed, 12/11/2013 - 10:01pm. Love the connection made between JFK and 9/11. However, 9/11 is different from the first of the great American political conspiracies. The difference is that we are all informed by what we've learned about conspiracies by the 50 years of relentless digging done to find the truth about the Kennedy assassinations. The media dam on what actually happened to JFK is collapsing with books like The Man Who Killed Kennedy-The Case Against LBJ and LBJ - Master of the JFK Assassination. I don't know what the last straw will be, but when that dam bursts it will bring down the 19-Arabs-with-box-cutters nonsense with it. That will not take another 38 years. Pecosin Rat on Thu, 12/12/2013 - 8:19am. .............. but even after fifty years the lid on the truth remains. The only tool for truth is the internet. I have told well above 300 people about 911, only 4 refuse to look into it. The others agreed, and the response was always the same....... Oh well what you going to do?........... PASS IT ON ! WISDOM on Thu, 12/12/2013 - 7:27pm. ....that's it's never too late until it's too late. We can still turn things around, we can still make it happen as a human race, we can still throw out the "bad" guys (primarly the socalled leaders of all the countries, sometimes with the best intentions though) who bring nothing but misery and suffering, if "we" as a whole decide to do so. But first more people need to know about the scams that are being pulled, about the lies that are fed to them day in and day out. More people need to know that there are many many people outthere who already know that they're being f...ed every day, and who want that to stop. So, pass it on indeed. No guarantees, but if we don't pass on the information, the odds of creating this better world for ourselves and future generations will diminish, every day. There's not that much time to waste. Sandberg on Fri, 12/13/2013 - 3:16am. 3. These were demolitions carried out with a combination of nanothermite and conventional explosives. 4. These are demolitions which did not use thermitic materials. 5. These are not demolitions. RL McGee on Thu, 12/26/2013 - 11:58am. I add to scenarios 1 and 2 that nanothermite can account for bomb reports, since different formulations yield different results, some of which can be quite explosive. Were the extra layers of the nanothermite chips found in multiple layers some sort of modifiers to add explosive power where needed? What about the white coating that Ryan mentions in that description of his FTIR test chip? Simon001 on Fri, 12/27/2013 - 1:01am. This was a film made in 1951, I think, and curiously, members of the Air Force used a "thermite bomb" to melt ice in order to recover a crashed flying saucer. 1951!!! NYCGuy on Thu, 02/27/2014 - 11:42am. Do we know when the compound thermite was first produced, or when it first went by that name? I wonder if it was later than the film, and those who developed it liked what had been an imaginary name in the film script, and adapted it for their 'real-world' purposes. In other words, I wonder if it's a case of science fiction preceding science fact. rm on Fri, 02/28/2014 - 1:45am. The SkyRide Towers, an attraction built for the Chicago World’s Fair in 1933, consisted of two 628-foot-tall steel towers, connected by an aerial suspension system that ferried passengers from one tower to the other. At the time, its staggering height made it the tallest structure in Chicago. Orangutan. on Fri, 02/28/2014 - 10:03am.